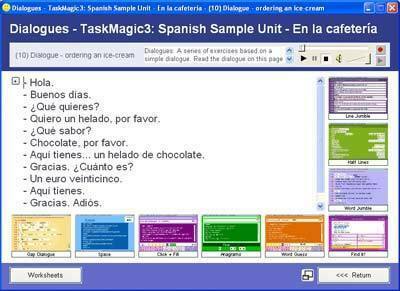 At the bottom of this post you will find a link to download a free standalone TaskMagic program containing a unit of work in Spanish on ordering food and drink in a cafeteria. The level is ideal for older primary school children, but it will also work well with older children working at a fairly low level or in need of revision. There is a fairly wide range of difficulty within the various exercises in the unit. 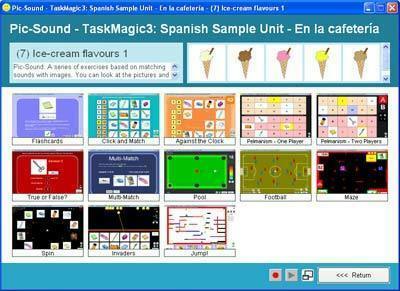 The download contains 16 TaskMagic3 files, which are accessed via a simple menu screen. 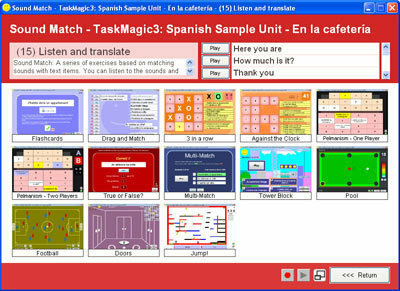 Each of the 16 TaskMagic3 files contains a variety of exercises, games and activities which can be used on individual computers or on an interactive whiteboard. 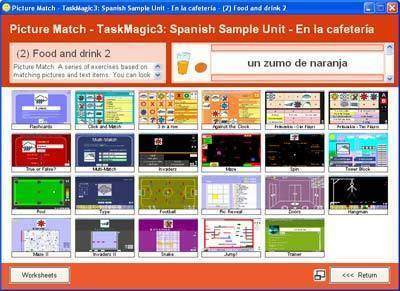 The screenshots of the 16 menu screens below show the games available for each of the 16 TaskMagic3 files. 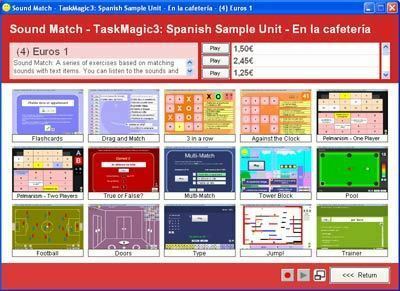 So that's a total of over 270 interactive exercises and over 60 worksheets based on the 16 TaskMagic3 files above. The download is completely free and not time limited. 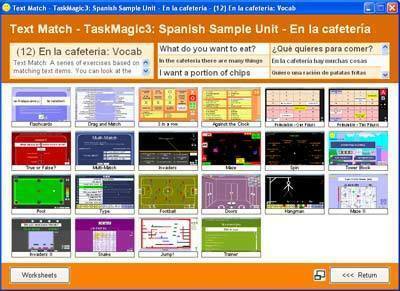 It is intended to give you an idea of the kinds of things that can be done easily in TaskMagic3, using your own content (your coursebook, schemes of work etc). This demo contains quite a lot of audio-based resources, which we felt were necessary in a standalone unit such as this one. You can make your own audio-based resources easily in TaskMagic3, although of course the files based on just text are much quicker to produce. 1. Click on the link, choose "Save", and decide where to save the zip file. 3. Then "Extract All the Files". Make sure the box to "Show extracted files" is ticked. This will make sure that the folder will open once the files are extracted. 4. Run the file TMSpCafeteria.exe (which is the one with the yellow smiley face, if you can't see file extensions). You can move these files to wherever you like, but keep the 3 elements (TMSpCafeteria.exe, TMSpCafeteria.exe.manifest, filesetc) together in the same folder. NB. 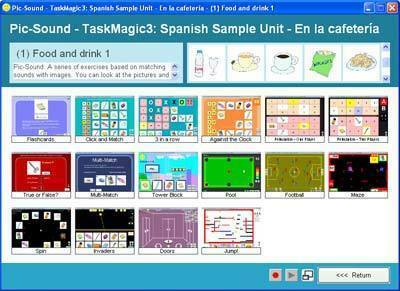 The main TaskMagic program doesn't make standalone exe packages like the download on this page - it makes files which can be accessed using the TaskMagic software. This is something I can use with my students. I teach Spanish 1 to seventh and eighth graders, which I suppose is equivalent to KS3 in the UK. In any event, my students present with a wide range of abilities, capacities and motivations. Therefore, it seems to be an ideal activity for "the range."